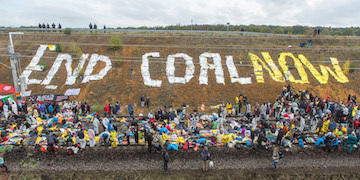 The world of environmental direct action has remained a secretive one, until now. Emily James spent over a year embedded in activist groups such as Climate Camp and Plane Stupid to document their clandestine activities. With unprecedented access, Just do It takes you on an astonishing journey behind the scenes of a community of people who refuse to sit back and allow the destruction of their world. Torpedoing the tired clichés of the environmental movement, Just Do It introduces you to a powerful cast of mischievous and inspiring characters who put their bodies in the way; they super-glue themselves to bank trading floors, blockade factories and attack coal power stations en-masse, despite the very real threat of arrest. Their adventures will entertain, illuminate and inspire.